The majority of the US & global economy is now service, rather than manufacturing or trading of tangible goods. Even the development of goods & systems increasingly takes on the character of service. CMMI is a reference model for process improvement meant to enhance the business performance of a wide range of organizations. Recent data from top CMMI users illustrates the quality & other business results that capable organizations get, such as customer satisfaction, higher income, defect reduction, on-time performance, & decreased costs. This webinar will briefly cover the CMMI for Services (CMMI-SVC) model, focusing on the service-specific process areas (SVC PAs), & show how the SVC PAs can enhance organizational performance. Part of the overview will show the aggressive adoption curve for CMMI-SVC (just released in 2009), including case studies & other industry adoption data. The webinar will also show users how to pick the right model pieces with which to begin adoption, & where to go for adoption guidance. 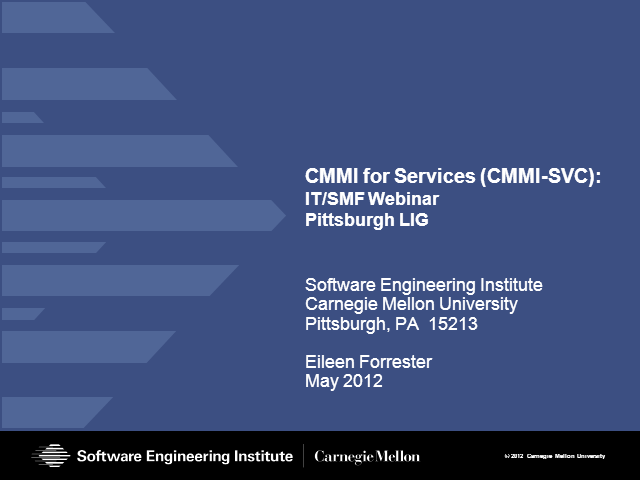 Eileen Forrester is the manager of CMMI for Services and the CMMI Learning Suite at the Software Engineering Institute. She is a senior member of the technical staff in the Software Engineering Process Management program at the SEI. She is also the lead author of the Addison Wesley book, CMMI for Services, Guidelines for Superior Service, the co-chair of the International Process Research Consortium, and the editor of the IPRC Process Research Framework. Forrester is the developer of TransPlant, a transition-planning process, and her current research area is in process-oriented approaches to service delivery, teaching, technology change, risk management, and emergent system types. Forrester has more than 35 years of experience in technology transition, strategic planning, applied research, process improvement, communication planning, and managing product, service, and non-profit organizations.